The brilliant and influential statesman, Itō Hirobumi (1841-1909), and the first prime minister of Japan’s modern state, has been poorly understood. This biography attempts to set the record straight about Itō’s thought and vision for Japan’s modernisation based on research in primary sources. It outlines Itō’s life: the son of a poor farmer, he showed exceptional talent as a boy and was sent to study in Europe and the United States. He returned home convinced that Western civilisation was the only viable path for Japan. 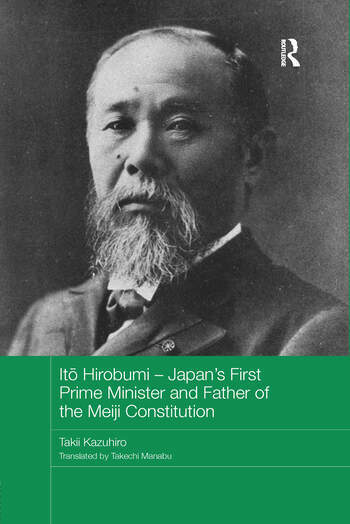 Following the Meiji Restoration of 1868, Itō became a powerful intellectual and political force behind reforms of Japanese laws and institutions aimed to shape a modern government based on informed leadership and a knowledeable populace. Among his many achievements were the establishment of Japan’s first constitution—the Meiji Constitution of 1889, and the founding in 1900 of a new type of constitutional party, the Rikken Seiyukai (Friends of Constitutional Government), which, reformulated after 1945, became the Liberal Democratic Party that has dominated Japanese politics in the postwar period. Concerning Itō’s role as Japanese Resident-General in Korea from 1905, the author argues that Itō’s aim, not understood by either the Japanese home government or Koreans themselves, was not to colonize Korea. He was determined to modernise Korea and consolidate further constitutional reforms in Japan. This aim was not shared by others, and Itō resigned in 1909. He was assassinated the same year in Manchuria by a Korean nationalist. The Japanese language edition of this book is a bestseller in Japan, and it received the Suntory Prize for Social Sciences and Humanities, one of Japan's most prestigious publishing awards.